Many entrepreneurs struggle to understand the business relevance of blogging. In fact, blogging is often dismissed as just another marketing tactic when, in fact, it is the no.1 lead generation tactic in inbound marketing – which is, of course, the best kind of marketing. Companies that generate 15 blog posts per month average 1,200 new leads per month with a 55 percent increase in website traffic. (Business2Community) And that’s not the only great thing about business blogging. Having an active blog can help your business attract new website visitors and convert them into leads, which will ultimately convert into clients. With every new article you post, you give search engines a chance to make your business more visible and help you attract potential customers. B2B companies with a blog report generating 67 percent more leads per month, according to Business2Community. This is by far the biggest advantage of business blogging. 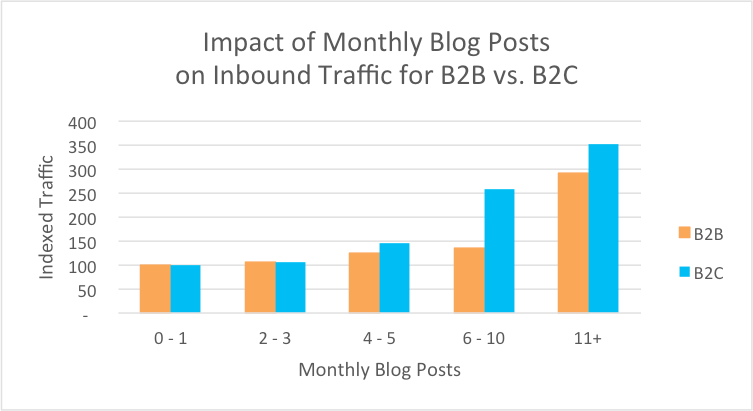 As the latest Hubspot benchmark study reveals, companies that published 16+ blog posts per month got almost 3.5X more traffic than companies that published between 0 – 4 monthly posts. Because you’re leveraging your own platform, you can produce high-quality content that your prospects appreciate and actively search for, and ensure its maximum reach. You can then distribute and amplify this content on your Social Media channels. By positioning your business as an industry thought leader, you gain prospects’ trust and loyalty over time, ensuring an ever-growing lead pipeline. Going a bit into the technical area, the more qualitative content you create, the more your website ranking will improve. If Google deems you a trustworthy source that is actively posting relevant content, you’ll be in the Search Results Hall of Fame. Research shows that blogging increases inbound links by 97 percent, the most important factor in Google’s ranking algorithm. The great thing about blogging is that, compared to posting content exclusively on third-party websites with a dismal organic reach and a disappointing paid reach, you are the master of your content and you can successfully deliver it to your prospects. This has become our mantra here at Emerge Studio. Every inbound strategy we work on starts with a talk about what your business does, what your main objectives are and how we can translate them into marketing objectives that you can base your strategy on. Once you have these SMART objectives figured out, you’ll have the marketing objectives that derive from them – website traffic, lead generation, conversion rates, etc. What will your content be about? 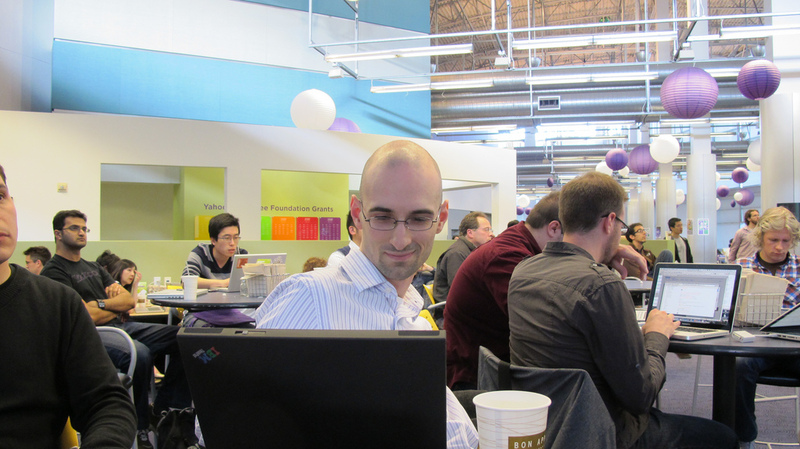 You should aim to tailor your articles to your personas, as best as possible. What interests them, what they struggle with, what they research and the types of content they share. A competitors’ analysis is also helpful at this stage, to get a sense of the type of content your industry prefers and the frequency with which they are accustomed to. Once you’ve selected your topics, do an extensive keyword research and make sure that you’re actively pursuing the most important keywords for your product/service. Not only should your articles be SEO optimized for these topics and keywords, in a context that is highly relevant to your target audience, your website should also be keyword-optimized. Following the inbound methodology approach, at this stage you should have your buyer personas defined, as well as their buyer journey. Ideally, you also have valuable content offerings such as ebooks, webinars, white papers or online courses that have already been mapped to the buyer’s journey. You can have two types of blog articles – the ones aimed at promoting a content offer, that will guide visitors towards a valuable lead generation download, and your regular blogging articles that focus on the latest trends and good case practices in your industry. Every article should have a relevant CTA (Call-to-action) that serves as the next step for your visitors. It can be a content offering that you’re promoting, an invitation to sign up for your email newsletter or any CTA that will lead prospects into the next step of the conversion funnel. Organize all your content in an editorial calendar that offers you a clear overview of what you’re going to write, when you’re going to publish it and how you will distribute it. For every business, the ideal blogging frequency will depend on a number of factors: B2B vs. B2C, type of industry, size of the company, target audience, marketing strategy, etc Your distribution channels will also depend on your business and, most importantly, your buyer personas. Yes, the next logical step is to start creating content – a lot of content. This is one of the biggest challenges in content marketing – producing large volumes of relevant content. But it is, in fact, the most rewarding inbound marketing tactic. 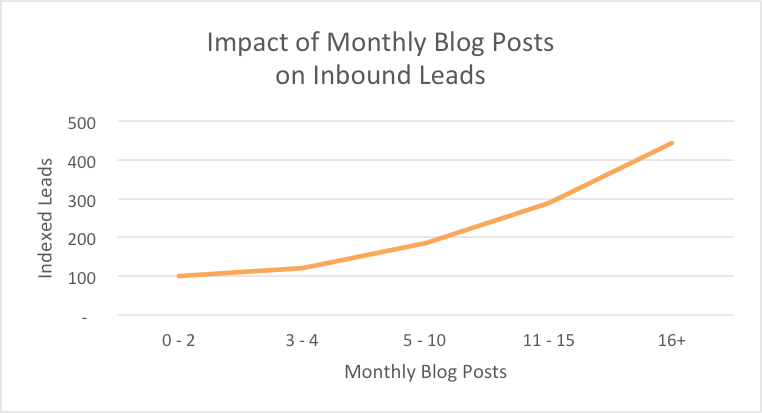 Both B2B and B2C companies surveyed in Hubspot’s recent benchmark study got more inbound leads the more blog posts they published. Their publishing frequency correlated with more leads generated. 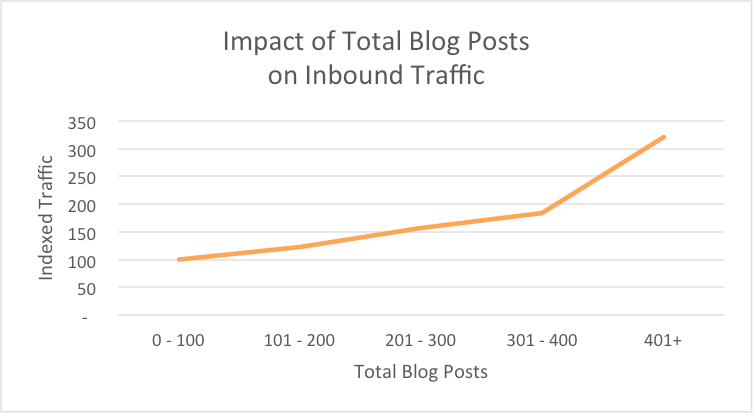 As for the total number of blog posts published, companies that had published 401+ blog posts in total got about twice as much traffic as companies that published 301 – 400 blog posts. 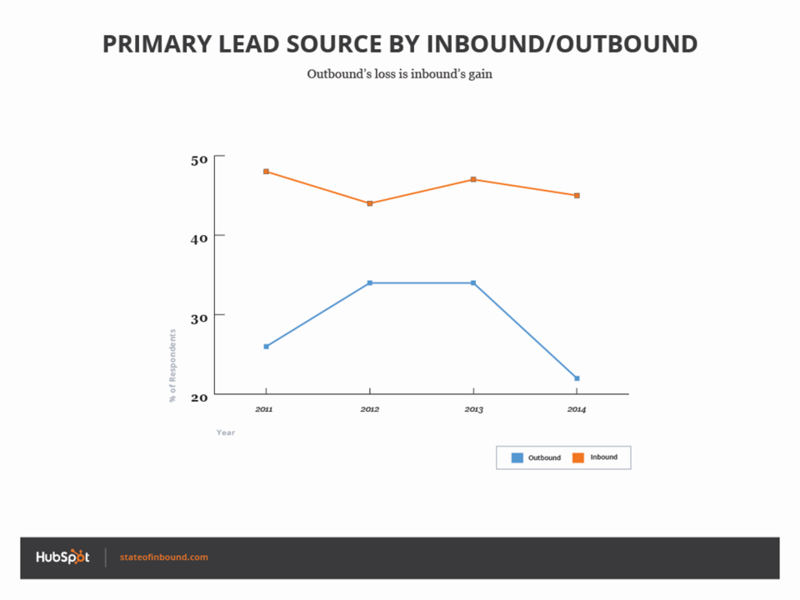 Inbound marketing tactics can take a while until they yield results. As you probably know, content creation can be analyzed after a minimum of 6 months. That’s because it takes time for your content to be indexed and you need a relevant readers sample to determine its success. When analyzing these articles, you’ll want to measure unique visits, CTR and the overall leads conversion rate. In an ideal scenario, you’ll be able to pinpoint exactly which article brought you most leads. However, visitors’ paths can be pretty windy and many of your articles will serve to assist the final conversion, as part of series of interactions that visitor had with your content. That’s why you need to monitor more than one KPI and have a constant focus on prospects’ interactions with your content, to determine the best optimizations for your blog. As inbound marketing continues to grow as a preferred marketing approach, blogging gains more popularity and recognition across different industries. Not just because people are talking about it but because it generates tangible business results. And that should be the goal of every marketing tactic – to drive business revenues and fortify your company’s brand.